Join West Elm, Design*Sponge, Pigeon Toe, Satsuma, and Skinny LaMinx to celebrate a Cloth, Paper and Clay cross-continental collaboration. 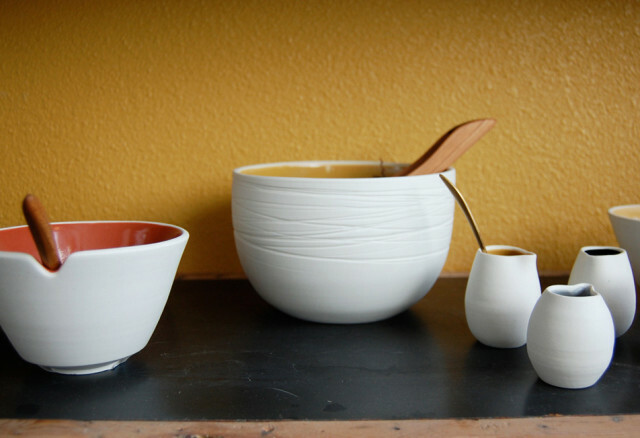 Clay goods from Portland’s Pigeon Toe Ceramics (their work shown above) meet cloth from Cape Town and letterpress from Corvallis at the West Elm book launch party for Design*Sponge at Home. It’s really not as confusing as it sounds; there will be ice cream. It’s cliché by now, but still true: Brooklyn and Portland keep getting closer and closer. Next week, September 25-26, Design*Sponge founder Grace Bonney, design blogger and proud resident of Brooklyn, NY will be in Portland – also known as just another stop on the NYC subway. (Is there another line not yet on the map – the W train, perhaps, heading west out of Brooklyn directly to Portland?). The Portland/Brooklyn connection is well documented. And the global possibilities for collaborations these days are pretty endless, what with that new-fangled Internet thing and all. Yet face-to-face meetings in tangible physical space still have their appeal. Thus Design*Sponge is touring to promote its – gasp – printed-paper, hardbound book, Design*Sponge at Home, and will be at the Ace Hotel’s Cleaners annex for a DIY craft party Sunday afternoon September 25, and at West Elm Monday evening September 26 for a book launch. The Design*Sponge at Home book brings together images and ideas Bonney has been brewing since she began her home design and DIY-oriented blog in 2005. And the book party, at West Elm in the Pearl District, brings together Pigeon Toe Ceramics (of Portland’s Central Eastside), Satsuma Press (of Corvallis), and Skinny LaMinx fabrics, who win the prize for longest-trip-from-home (Cape Town, South Africa). The three women who run these small companies have collaborated via internet and are doing a show and tell (and sell) alongside Bonney and her new book. Across their three media (hand-thrown ceramics, letterpress, and fabric) all share a rather sweet design sensibility, simple and delicate, not too serious but respectful, a bit prim yet modern. Come see for yourself! The West Elm party Monday (6.30-8.30 pm) promises ice cream from Salt & Straw and proceeds will benefit SCRAP. The Sunday craft event (2-4 pm) requires tickets ($25), and you’ll make your own stamped print (BYO fabric, clothing or tote), with benefits going to p:ear.